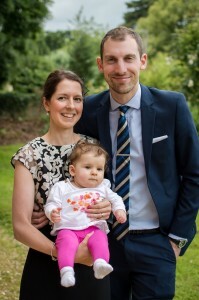 Louise (MPharm 2005) met her husband Mark (BSC 2004) in their first year at Cardiff University. ‘I met Mark in February of our first year and our first date was on Valentine’s Day when he cooked for me in his flat in Talybont, how romantic! Mark went all out and served a Tesco Chinese ready meal that he cooked in the oven, rather than the microwave, followed by a Sara Lee chocolate gateaux all washed down with 2 bottles of red wine! After graduating from Cardiff University Mark worked for an accountancy firm in Birmingham and I moved to Stockport and worked initially at Stepping Hill Hospital to complete my pre registration training year before then qualifying as a pharmacist in 2006. I then got a job at University Hospital North Staffordshire where I completed my postgraduate diploma. Mark and I spent three years travelling up and down the M6 every weekend before I moved to the University Hospital Birmingham. We were lucky to both get a 6 month sabbatical in 2010 to go traveling around South America and South East Asia, before returning to our jobs in Birmingham. We now live in Solihull along with our one year old daughter. Mark works in finance for an energy company and I work as Lead Pharmacist Women’s and Neonatal Services at Birmingham Women’s Hospital.